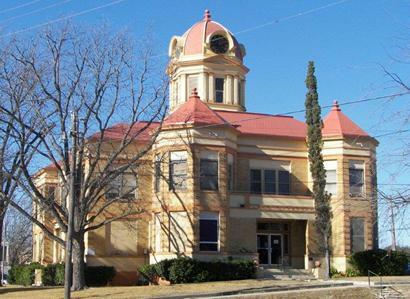 Kinney County Courthouse, Brackettville, Texas. Human inhabitation of Kinney County began thousands of years ago. Spanish expeditions through the area began in 1535 and continued throughout subsequent centuries. An attempt at establishing a Franciscan mission in 1775 failed, as did settlement by Dr. John Charles Beales in 1834. 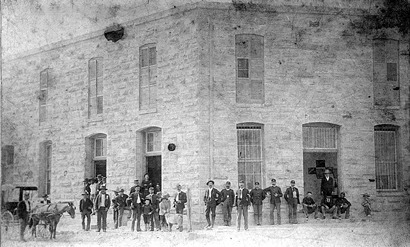 Despite the hardships found in the area, Kinney County was carved out of Bexar County in 1850, two years before the U.S. Army opened Fort Clark as a frontier outpost. 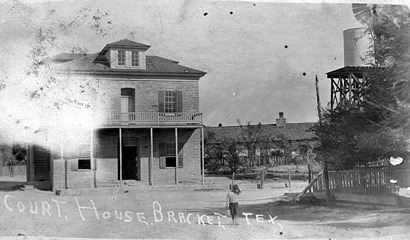 That same year, in 1852, local inhabitants established the Brackett settlement, named for Oscar B. Brackett who set up a stage stop, freight office and dry goods store to service the stage line from San Antonio to El Paso. 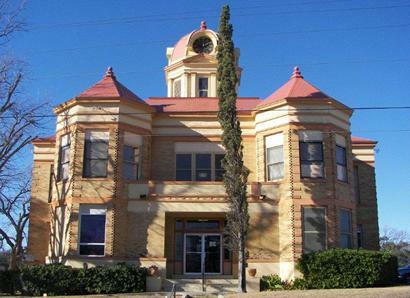 Named for early settler and adventurer Henry Lawrence Kinney, Kinney County did not formally organize for 21 years; officials first met in Brackett's home in 1873. Brackettville, as the town had come to be called, was chosen as the county seat. 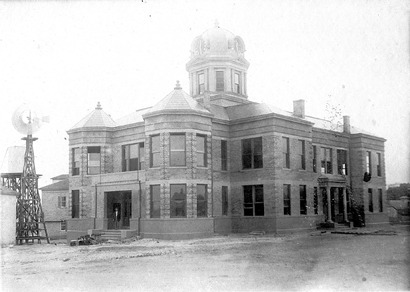 Subsequent meetings were held in the Kartes and Co. building until 1879, when the county's first courthouse was built. 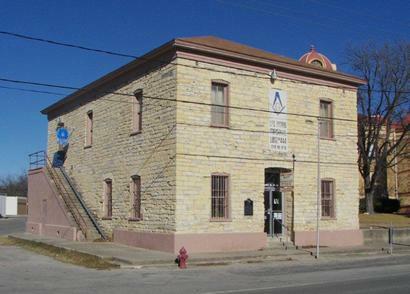 The county used the 1879 building, which later housed a post office and Masonic lodge, until 1911. 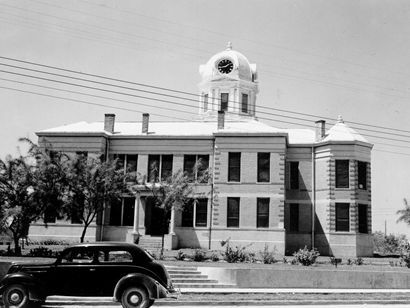 That year, the county first occupied this courthouse, designed by L.L. Thurmon and Co. of Dallas. Falls City Construction Co. of Louisville, Kentucky, served as General Contractor. 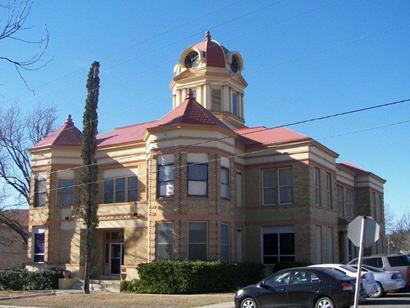 The Kinney County Courthouse exhibits Beaux Arts Classicism. Detailing seen on the central bell tower is repeated on the octagonal corner towers and columned entryways. Buff brick is accented with D'Hanis red brick banding and corner quoins. 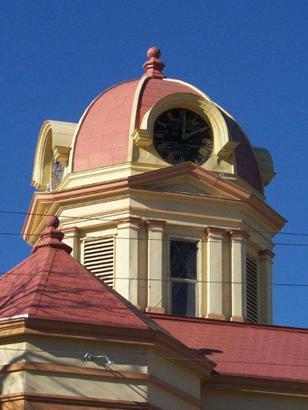 The Seth Thomas clock in the bell tower completes the building, which, after some alterations, still demonstrates the massing, style and design selected by the early county commissioners. It is not uncommon for people to approach me when I am photographing county courthouses. They generally fall into two categories. Those who understand my interest and those who don't. During my visit to Brackettville in January of 2009, I met Tully Shahan and he definitely falls into the former category. After working at the courthouse for over thirty years, he now has his own law office across from the courthouse. He encouraged me to explore the interior and look at the copies of the original blueprints for the courthouse which are framed and hanging on the walls on the first and second floors. A close examination of these blueprints reveal changes that have been made to the building over the years, but the courthouse maintains much of its original exterior condition without any modern additions. Designed in a Beaux-Arts style, the courthouse was completed in 1911, built mostly of buff brick with D�Hanis red brick on the corner quoins. The most striking features of this building are the octagonal towers framing the front entrance and the octagonal clock tower. The clock tower received some restoration work in 2005. 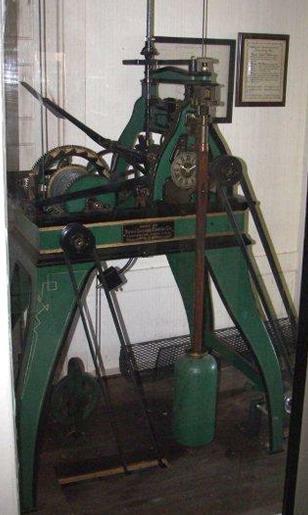 Mr. Shahan told me that the clock still works, but the county does not have anyone who can wind it on a regular basis.